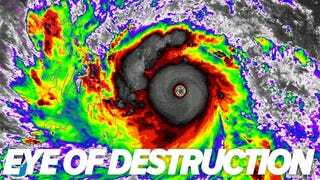 Writing for Quartz, meteorologist Eric Holthaus says that the super typhoon Haiyan about to hit the Philippines is the worst storm he has ever seen. With sustained winds of 190mph (305km/h) and staggering gusts of 230mph (370km/h), its "intensity has actually ticked slightly above the maximum to 8.1 on an 8.0 scale." Updated: It broke 235mph. Videos of the impact added. Holthaus says that Yolanda—its Filipino name—beats "Wilma (2005) in intensity by 5mph—that was the strongest storm ever in the Atlantic," which makes it a member of the select club of Worst Storms Ever in the Planet. Only three other storms since 1969 have reached this intensity. That's certainly foreboding enough, but the humanitarian disaster that may unfold could be immense. The latest forecast track by the JTWC shows Haiyan passing very near Tacloban, a city of a quarter million people, and Cebu, a city of nearly one million people. Update: People in the Philippines are posting videos, reporting that the wind is so strong that the rain is "falling" completely horizontal, parallel to the ground. No reports on victims yet, but it is going to be really bad. According to Holthaus, it's headed to Vietnam. Our thoughts are with the victims of this terrible storm. You can donate here. Haiyan is the worst storm in one of the worst typhoon seasons in history. There's no doubt that weather is getting more violent every year. It's perhaps the biggest challenge to our prosperity and survival.